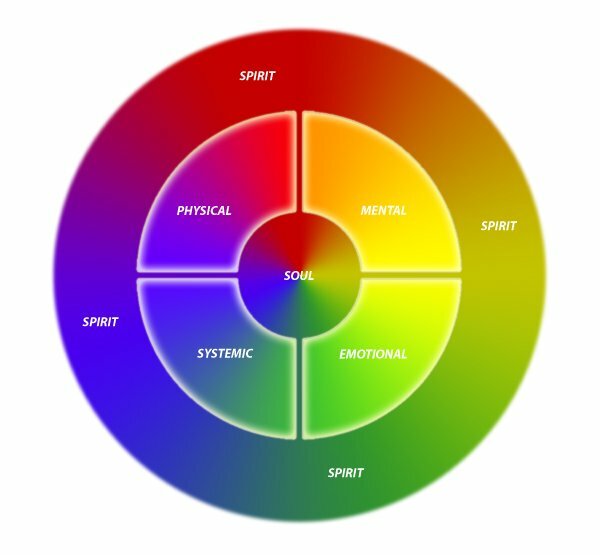 The Whole Person Wheel provides a simple, beginning structure for conceptualizing the elements of the human being and relational experience. We benefit when all parts of our being are acknowledged and accepted. All parts of ourselves want and need to work together. This discussion of “Soul” and “Spirit” is not offered from a religious or theological perspective: but rather, attempts to provide a framework allowing the concepts of “soul” and “spirit” to find a deeper integration with how “normal” human life is viewed. How we define problems and create solutions depends on our experiences. Particular theory or practice can only provide a “Point of Entry” to the whole human system. The Whole Person Wheel allows us to expand into a truly integrative approach. It allows us to recognise the Soul in the physical, mental, emotional and systemic aspects of Earthly existence. It allows us to acknowledge the human being as part of the Spiritual; the expanded nature of life. The Spiritual Life is The Mundane Life. The Mundane Life is the Spiritual Life. "Soul" and "Spirit" have become buzz words among the healing community, including psychotherapists such as myself. What is the true nature of the Soul and what, exactly do we mean by that word? What is the true nature of Spirit and what, exactly do we mean by that word as well? While there is a multitude of different answers to those questions, my only response is..."Who really knows?" And most likely, what we think we know today will change by tomorrow. After all, "The more we know, the more we know we don't know." What I do know is that I often go to workshops; both traditional mental health workshops, as well as, workshops given by alternative treatment providers or spiritual growth facilitators. What I find is that each and every theory or practice has something of truth and value to it. However, when one modality excludes another, it weakens the service of the excluding modality as its limitations are experienced by those it serves. Integrating all that can be offered is what will allow us to fully address the needs of ourselves and others. Our approach to healing, and life in general, seems to be best served by a "Both / And" approach, rather than the "Either / Or" perspective. So with that said, I offer the Whole Person Wheel as a simple frame work for moving toward integration.